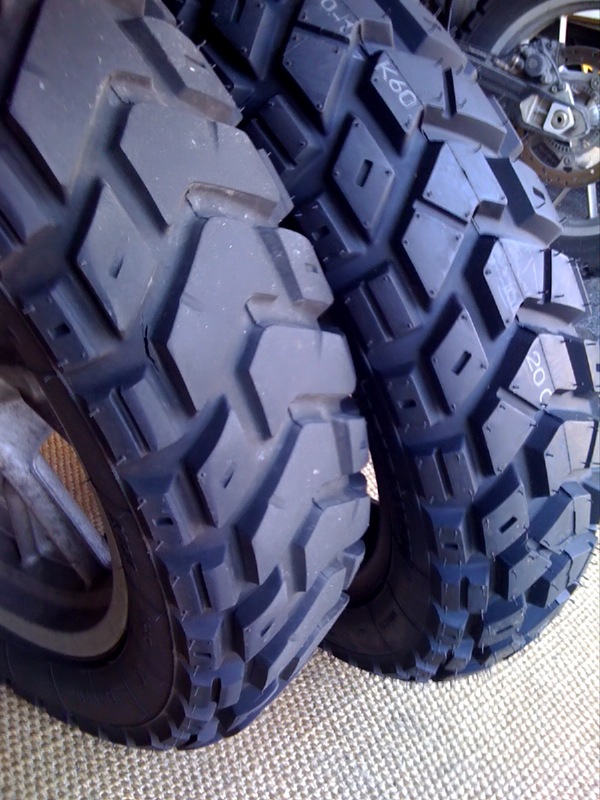 HEIDENAU DS TIRES – Where to buy? 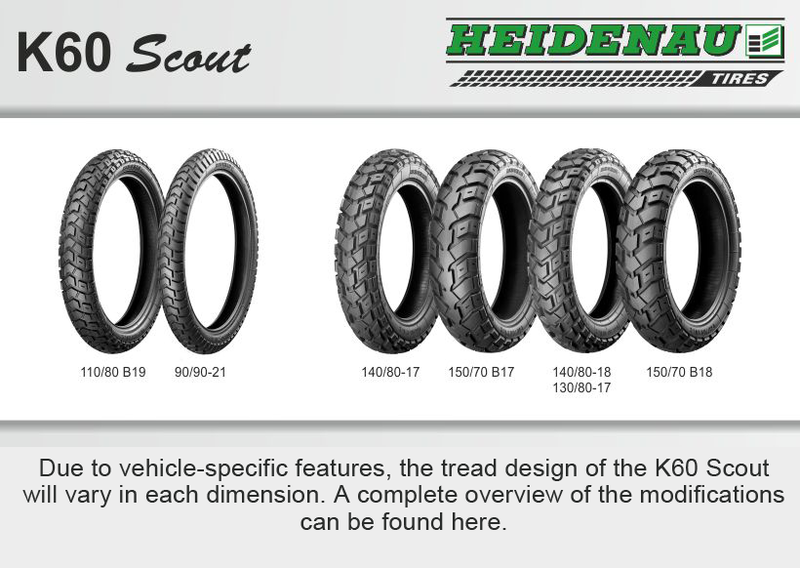 I have been asked numerous times where we buy our Heidenau K60 tires. 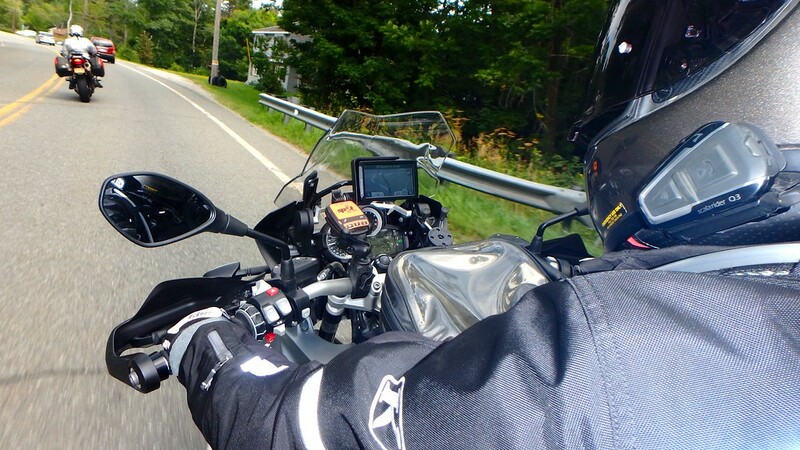 On this trip this summer because we rode the Triumph Tiger 800XC bikes we needed a 150/70-17 rear and 90/90-21 inch front. The new version of the K60 is the Scout. You can find these tires at many dealers now and most seem to have stock. There was an issue with the 150’s for a while last year with production out of Germany. I think it had something to do with the company having to change how they made this tire to meet the environmental standards. This seems to have been worked out. 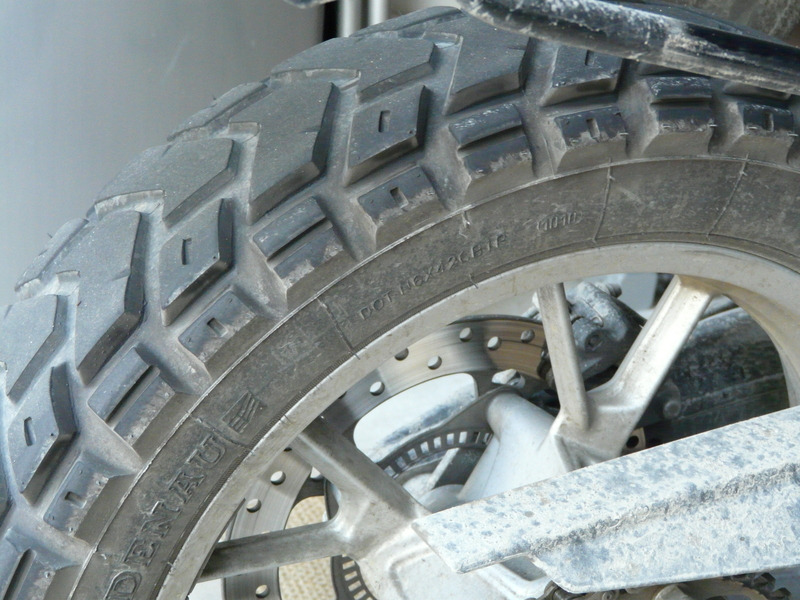 On our 2010 BMW F650GS we are on our second set of the Heidenau tires. Rear size 140/80-17 and front 110/80-19. 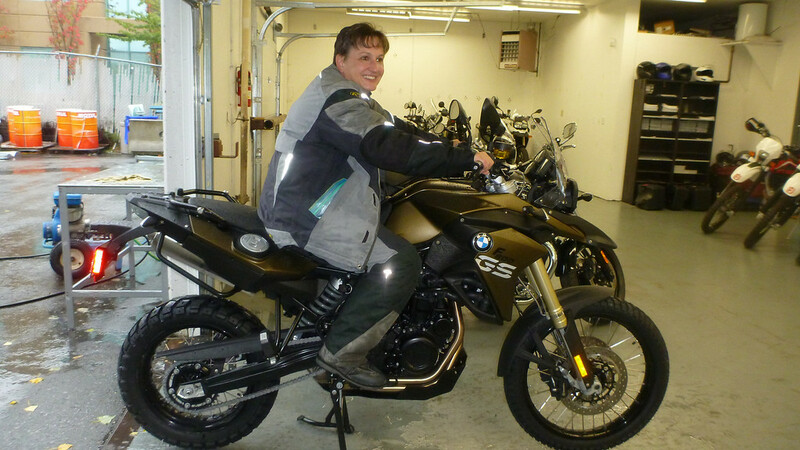 Interesting the tires for the Beemer are more money than the tires for the Tiger or the F800GS. We buy from Robert at MTR Sports. Not a fancy web site but MTR sells in both the USA and Canada. Seems to have competitive pricing but again you can find these tires from many other dealers and even some BMW dealers are stocking them too. MTR carries most of the items we need like brake pads, oil filters, stuff like that. The best way to contact MTR is either by calling or email. We really like the Heidenau tire because of its DS appeal and handling on the road. Tires are so subjective and truly depends on your riding demands. Some call this tire an 50/50 tire. I think it is more like a 80/20? I mean we commute everyday on the Heidenau and have taken it off-road on forest service roads, gravel, mud, sand, etc. But it is not a true knobby. Because we do not have a tire changer to go from a street tire to a more aggressive tread when we want, we ride with these to try to cover whatever road we take. Our first set of tires we got over 19,000 KM out of them and that was after we rode cross-country in the summer of 2010. When we went to get the new Heidenau’s installed our dealer asked why were changing out our tires when there appeared to be so much tread left. 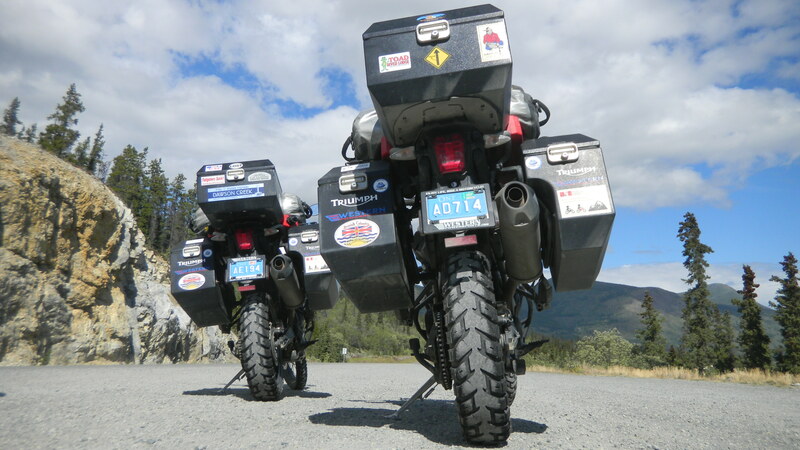 The tires we rode though northern BC, Yukon and Alaska this year had over 14,000 KM and quite a bit of life in them when we gave the Tigers back. Presently, Cheryl and I both have our second set on our Beemers and I am up to 13,000 KM on mine and they are just beginning to show some wear. We keep the pressure up as per Heidenau recommendations, 36 PSI front and rear. We might lower the PSI just a bit if we are rocky or loose terrain but not by much. 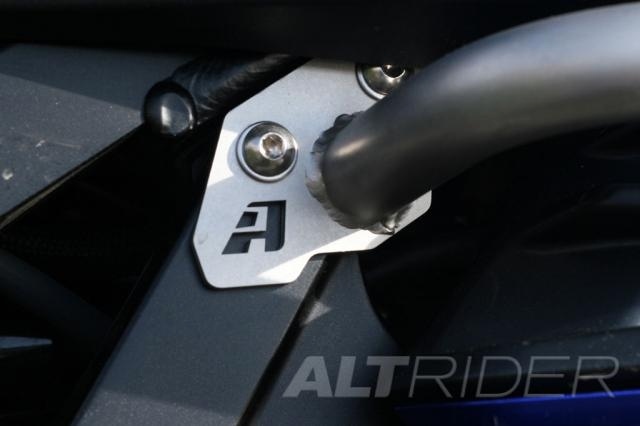 Again different thoughts about lowering PSI off road and getting better traction. We feel better by having the PSI up on such a heavy bike, less risk of damaging the tire and rims. Just our opinion. The tires before Heidenau added the center strip used to square off quite a bit but with the new tread pattern they seem to keep their shape better for longer. 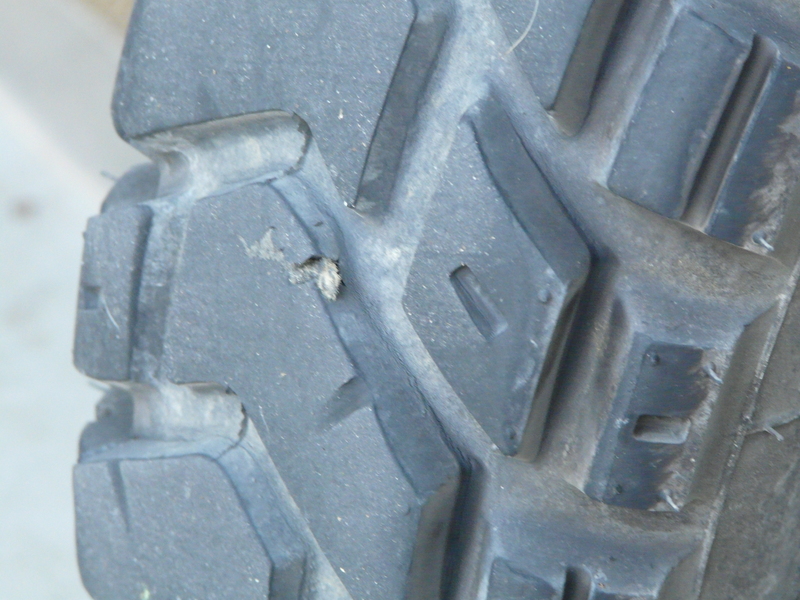 You can see a little tear in the old tire but it did not seem to penetrate enough to jeopardize the tire and we never lost air. Back in the summer 2010 on day 2 of our 26 day trip I got a nail puncture in my rear. We plugged it and I rode the entire trip and then some on the plug. Again probably not the best practice but the hole was dead center on one of the knobbies and the plug held until I installed new tires. So, in the end we have found our tire, have you? This tire for us is such a great well-rounded tire and remember where we live….the WETcoast of BC, Canada near Vancouver and it rains a lot. As far as traction on wet roads, we both have confidence in this tire. Mind you we do not over do it in the rain but at the same time we can still have fun and be safe. Happy Tire hunting! Remember tires, like seats, shields etc are all subjective and you just might have to try things out first to find out either the reviews were right for you or not. We are very happy this tire is out there and we can get them on our bikes. 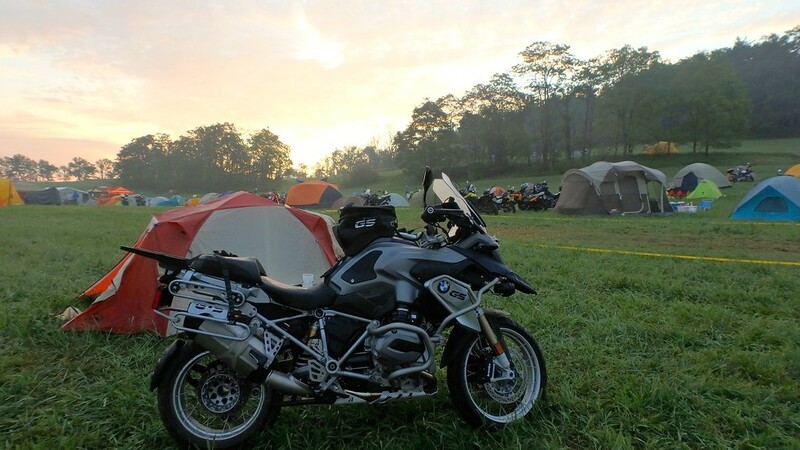 I have them on my non-DS bike (BMW R100RT) and they work great. On pavement and gravel (Dalton) I have no complaints though I have absolutely no idea regarding their life. They sell them at Adventure Cycleworks here in Fairbanks though my weird rear tire size had to be special ordered. 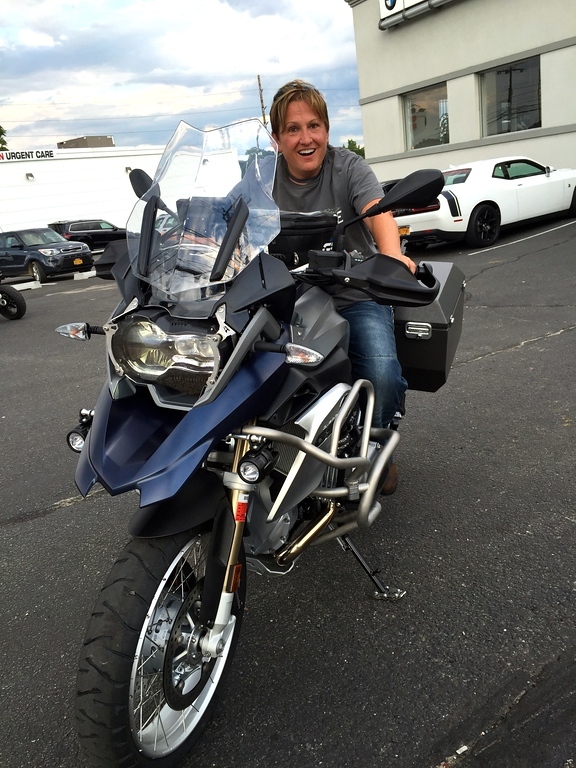 yeah we saw them at Adventure Cycleworks when we were there….Dan just got done installing two sets on a pair of 1200GSA’s. They last long! I did 20 000kms on my rear with my Heidi’s and super impressed with them. 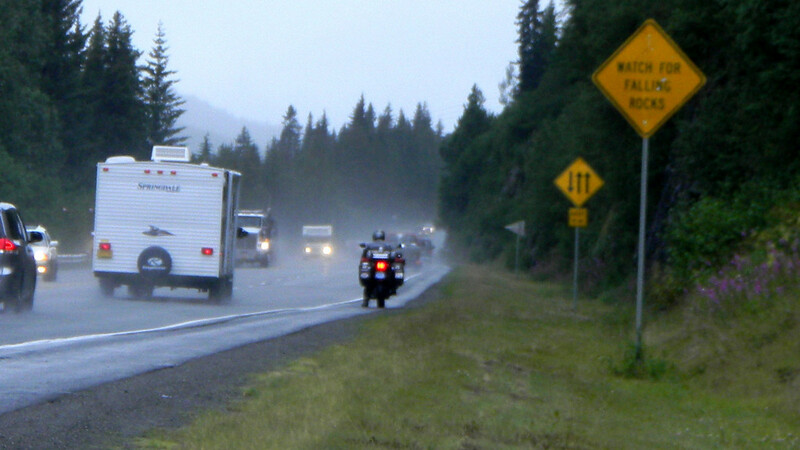 Now the new set is on 6500 kms of EXTREME riding conditions including severe rocks, stones and sand. My GS650 started falling apart and we had to fix it (and pieces breaking off) along the way, but the tires did not give a moment of troubles. My Track T-800CDI did 2 x 25.000+km. 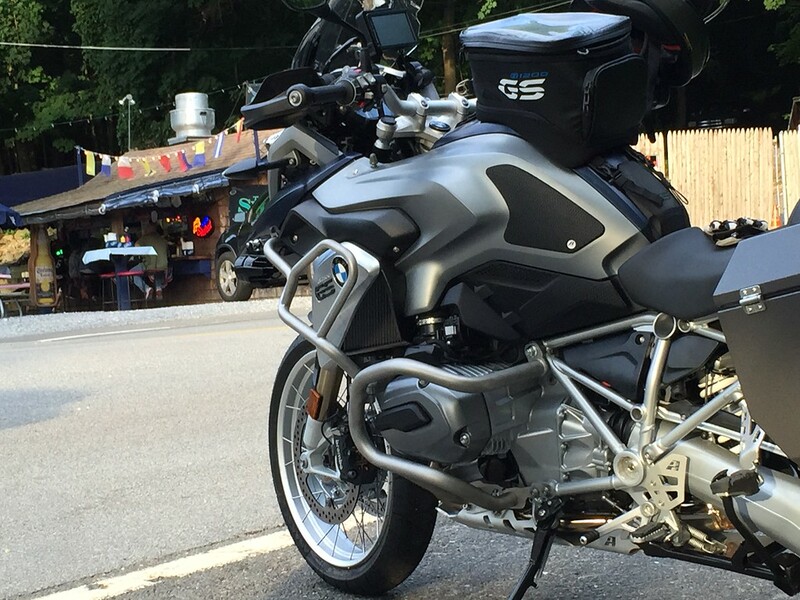 on K60 tires without problems. Very satisfied about the performance. Since I don’t plan to drive heavy off road -mainly dirt- and gravel roads- and use the bike to commute on a daily basis, I have chosen the Heidenau K76 for 2014. They were mounted February 11th. and so far I think they do even better on the tarmac. To soon to make a full review though. Loving the K60’s. Mounted them on my Vstrom right before a ride from Edmonton to Los Angeles and back and they handled it superbly! That trip and a few others and I have close to 15,000 on them and one would think they aren’t even broken in when comparing them to other brands. It was seeing you ladies use them that made me try them out. I’ll never try another tire as they are just so good in everything. I’ve started buying my K60’s from MTR now as well. Robert was very prompt with service/phone call and shopping was fast to Alberta. Yes, there’s a bike dealer here in town that’s cheaper but once you’re scorned you give your money to those you trust. :). 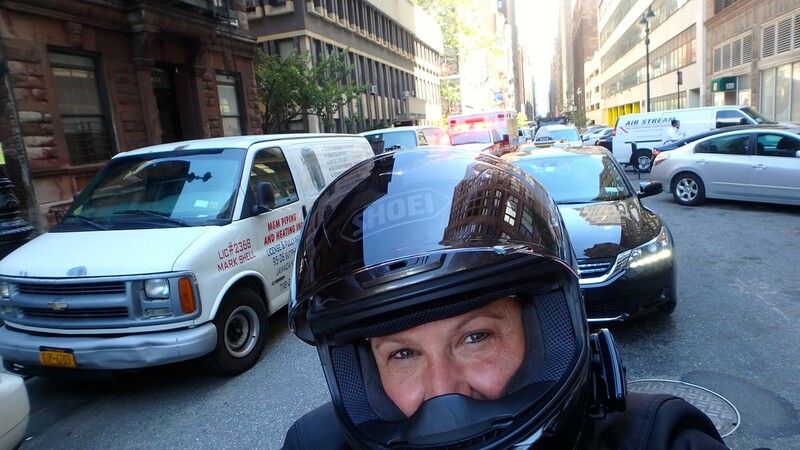 First set was 14,000 kms – Vstrom 650, solo rider, a LOT of luggage. Only removed as I was riding to Baja and didn’t want to bother changing during the trip. Thanks for suggesting MTR in one of your previous trip posts. Double post – once in Feb and once now. Oops! Delete if ya like, Leslie. Sorry! Or maybe I just really like these tires :). No problem I really like these tires too. 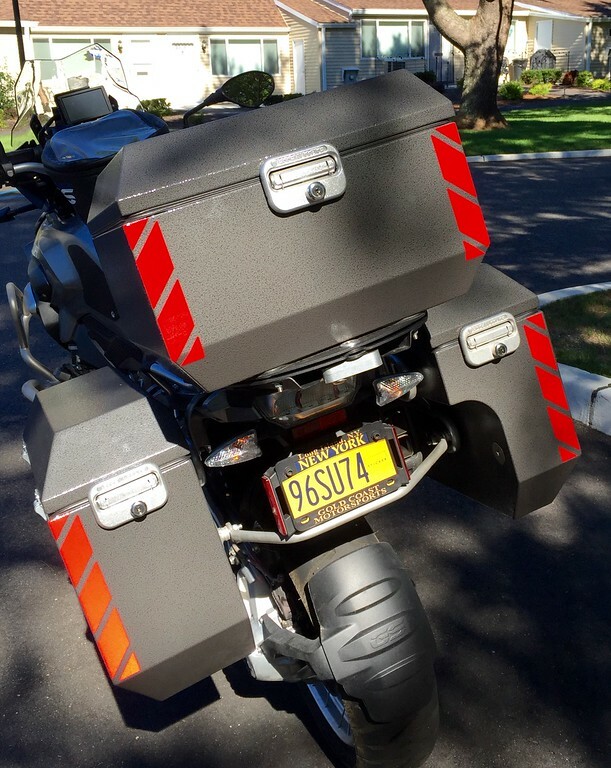 I have Metzler Karoo 3 on my bike now because on my last trip the dealer who serviced my bike in Connecticut did not get my K60’s in time.